5. Buffalo Wild Wings: The sports-centric brand stays true to its roots on mobile. Its app features a ‘Fight for Fandom’ game that allows fans to compete with other guests to determine which wings, beer or sports reign supreme. Opting in adds you to your current location’s leaderboard, where patrons can ‘fan up’ your picks, moving you up in the leaderboard rankings. A new campaign has fans talking with BWW hashtag #BWWBigKick, which ties to the brand’s new mobile gaming app based around Football Fever, called Coca-Cola Zero Big Kick Challenge. This not only positions the brand for engagement growth, but also increases location-based actions. Twitter: 312,079+ followers; Facebook: 11 million+ fans. 4. 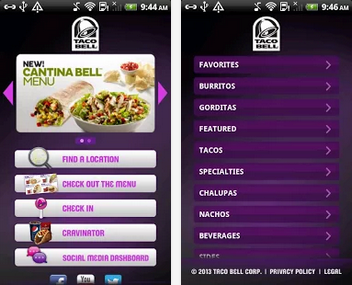 Taco Bell: The Live Mas brand has been rocking it on social and mobile. We saw the shift in Q1 2013 when the chain unseated McDonald’s on our RSMI Overall Top 250 brands list. On mobile, TB found a way to integrate emerging social mobile app Snapchat into its marketing strategy. As Tressie Liberman, Taco Bell’s Director of Digital & Social Marketing, recently told us at the Foodservice Digital Marketing Summit, Taco Bell takes a different approach to digital and mobile strategy by bridging the gap between being a brand and being a friend. From hosting private local events for its social customers in an effort to use user-generated content to highlight its Cantina Double Steak Quesadilla to a stunt surrounding Taco Bell Canada’s late adoption of Doritos Locos Tacos, which had angry tweeters literally eating their words, Taco Bell is certainly thinking outside the bun. Twitter: 835,840+ followers; Facebook: 10 million+ fans. 3. McDonald’s: McD’s recently stepped up in the mobile ordering and mobile payments game. The fast food chain also named its first-ever Chief Digital Officer this year, proving their hunger for innovative digital/mobile strategy is only getting started. McDonald’s is testing an interactive in-store mobile game that’s activated when a user places their mobile device on one of the tables. McD’s recently teamed up with the NFL to promote a new gaming app that allows McDonald’s consumers to input specific gaming codes into the app to receive additional advantages within the game. Additionally, McD’s is promoting the product through its first mobile ad campaign. Twitter: 1.7 million+ followers; Facebook: 29 million+ fans. 2. Chipotle: The Fresh Mex chain has essentially brought the in-store customization right to branded mobile app, allowing guests to build their order with no details missing. Extra chicken? Special order instructions? The options are all there. 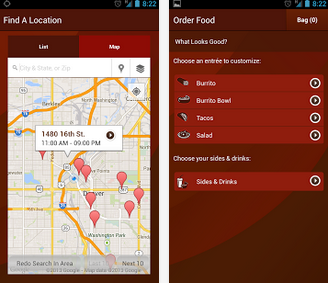 App users can also view nutritional and allergen information and save orders for quick ordering in the future. Want to make a payment before stepping foot in the store to pick up your order? You can do that through the app, too. And all of this doesn’t even touch on Chipotle’s mobile gaming app Scarecrow, which recently became a viral hit. Twitter: 273K+ followers; Facebook: 2 million+ fans. 1. Firehouse Subs: A smaller brand, but innovative in its own right, Firehouse Subs is climbing the ladder in mobile and digital. The hot subs brand's mobile site is responsive, meaning it adapts to the device a consumer is using to access the site, making it easier to navigate, especially while on-the-go. The mobile site allows consumers to find Firehouse locations and even includes online ordering. The main tabs include menu items, information about the Firehouse Subs Public Safety Foundation, Firehouse Subs gear, News & Promos, and links to all their social sites, including Facebook, Twitter, YouTube, Foursquare, and Instagram. Firehouse also has its own app for online ordering. Twitter: 27K+ followers; Facebook: 481K fans. For more mobile insights, check out our comprehensive 2013 Restaurant Mobile Social Consumer Trends report here.